Home / KnowledgeBank: the economy made simple / Who sets exchange rates? We do not set the exchange rate. But our actions can indirectly affect the value of the pound. An exchange rate is just a price: the price of one country’s currency in terms of another country’s currency. So if the exchange rate from UK pounds to US dollars is 1.35, then £1 will buy you $1.35. Sometimes you will hear that the pound has got stronger or ‘appreciated’. These are just two different ways of saying that the price of the pound has risen compared to another currency. More recently, the pound weakened significantly. After the United Kingdom voted to leave the European Union in June 2016, the pound recorded its biggest ever one day fall against the dollar. How does the exchange rate affect me? The short answer is: it depends who you are. You are most likely to notice the exchange rate when you travel overseas. When the pound is strong against the dollar, for example, you get more dollars for your pounds. So the stronger the pound, the cheaper it is to buy things abroad. The same applies to things you buy in the UK which come from abroad. For example, when the pound is stronger, food and other items that come from overseas become cheaper. Businesses are also affected by the exchange rate. Many companies buy things from abroad (imports) that they then use to produce goods here. A stronger pound means that these imports are cheaper. Other businesses sell their goods to customers abroad (exports). A stronger pound means these goods are more expensive for foreigners to buy – which can lead to lower sales for UK exporters. 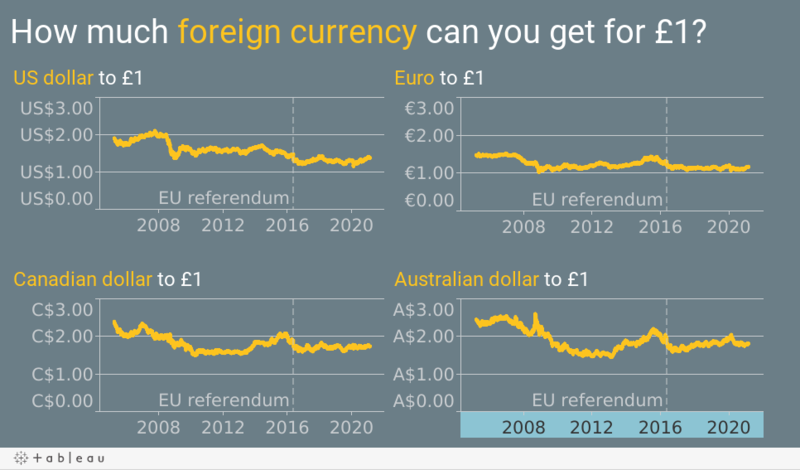 So in general, people who buy more things abroad than they sell typically prefer it when the pound is strong. And people who sell more things abroad than they buy typically prefer it when the pound is weak. In the UK alone, foreign currency trades worth over £1 trillion take place in financial markets every day. These markets are a complex network of computers, rather than a physical market, allowing traders to buy and sell currencies 24 hours a day. How does the Bank of England influence the exchange rate? Many factors affect the demand for pounds in financial markets and hence the strength of the pound. It is the Bank of England’s job to make sure that price rises (also called inflation) are limited, as this supports a stable and healthy economy. To do this we use a key interest rate in the economy, known as Bank Rate. Typically, if Bank Rate goes up, so does the strength of the pound. This is because higher interest rates in the UK lead investors to demand more pounds relative to other currencies. More broadly it is the Bank of England’s role to maintain a stable economy and financial system. If the UK economy is viewed as safe and sound then more people will want to invest in the UK, which will also lead to a stronger pound. What is the Prudential Regulation Authority (PRA)? Why do we regulate banks? How is the Bank of England independent of the Government?